Inside of the rotunda of Union Station in Pittsburgh showing the city's name as commonly spelled in 1900. The name of the city of Pittsburgh, Pennsylvania, has a complicated history. Pittsburgh is one of the few U.S. cities or towns to be spelled with an h at the end of a burg suffix. Pittsburgh was named in honor of William Pitt, 1st Earl of Chatham, often referred to as William Pitt the Elder to distinguish him from his son William Pitt the Younger. Advertisement for The Pittsburg Dispatch from 1876. The paper was an early adopter (1840s) and late holdout (1923) of the "Pittsburg" spelling. Pittsburgh (originally Fort Duquesne) was captured by British forces during the French and Indian War (Seven Years War). The earliest known reference to the new name of the settlement is in a letter sent from General John Forbes to William Pitt the Elder, dated 27 November 1758, notifying Pitt that his name had been given to the place. In that letter, the spelling is given as "Pittsbourgh." As a Scotsman, General Forbes probably pronounced the name /ˈpɪtsbərə/ PITS-bər-ə, similar to the pronunciation of "Edinburgh" as a Scotsman would say it: /ˈɛdɪnbərə/ ( listen) ED-in-bər-ə. The first recorded reference using the current spelling is found on a survey map made for the Penn family in 1769. In the city charter, granted on March 18, 1816, the Pittsburgh spelling is used on the original document, but due to an apparent printing error, the final 'h' is omitted on official copies of the document printed at the time. Even before the federal government endorsed the Pittsburg spelling in 1891, that orthographic variant was well-attested. Its use by The Pittsburg Dispatch newspaper, for example, dates back at least to 1847. 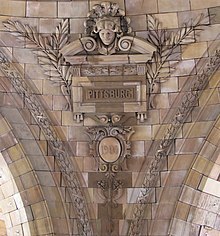 The city's name is commonly misspelled as Pittsburg because innumerable cities and towns in America make use of the German -burg suffix, while very few make use of the Scottish -burgh suffix. This problem is compounded by the fact that from 1891 to 1911, the spelling of the city's name was federally recognized as Pittsburg. The city was chartered in 1816, its name being spelled without the h, and its official form is still Pittsburg. The h appears to have been added by the Post-Office Department, and through that action local usage appears to have become divided. While the majority of local newspapers print it without the h, certain others use the final h.
Pittsburgh, a city in Pennsylvania (not Pittsburg). Notwithstanding the Board's reversal, the 'h'-less spelling variant remained in use for years. Some local daily newspapers carried it in their titles until the early 1920s, when The Pittsburg Dispatch and The Pittsburg Leader ceased publication and The Pittsburg Press became The Pittsburgh Press. The confusion and controversy surrounding the alternative spellings means that both the Pittsburgh and the Pittsburg spelling were commonly encountered around the turn of the 20th century, and continued uses of Pittsburg still occur to this day. Many cities across the United States named after the city of Pittsburgh, such as Pittsburg, Kansas, Pittsburg, California, and West Pittsburg, Pennsylvania, continue to use the Pittsburg spelling in their names. Other independent municipalities, such as the borough of East Pittsburgh, Pennsylvania, reflect the modern spelling. The T-206 Honus Wagner baseball card from 1909. Perhaps the most familiar reference to the Pittsburg spelling is on the renowned 1909 T-206 baseball card of Pittsburgh Pirates legend Honus Wagner. Its scarcity, even at the time, combined with Wagner's reputation as one of the greatest players in baseball history, made it the most valuable sports card of all time, with one pristine specimen yielding $2.8 million at auction. It has been characterized as the "Holy Grail" of baseball cards. The city name displayed across Wagner's jersey on the card was an artistic addition that did not actually appear on the Pirates' uniforms of the time. The portrait of Wagner makes it appear as if there could be an H on the end, cut off by the border of the picture, but the caption beneath it is "WAGNER, PITTSBURG", confirming that the omission of the H was intentional. The presence of the -h at the end of the word Pittsburgh is occasionally recognized in Pittsburgh culture. It is often rendered as PGH. For example, Pittsburgh International Airport's abbreviation is PIT, while Union Station's abbreviation is PGH; the area's Fox affiliate takes their calls, WPGH-TV from this. (This is ironic considering that Union Station, which opened in 1903, bears a relief on its rotunda that spells the city's name without the -h.) A recent playful take on the final -h of Pittsburgh appears in the name of the Pittsburgh Water and Sewer Authority's brand of bottled water: PGH2O, which is a portmanteau of the abbreviation PGH and the chemical name for water, H2O. In homage to the city's history, the "Pittsburg Plunge" at Kennywood park retains the alternate spelling without the "h". Alburgh (town), Vermont, a town whose name was changed from Alburgh to Alburg in the 19th century, apparently by influence of the same 1891 decision that applied to the spelling of Pittsburgh. The original Alburgh spelling was restored in 2006, more than a century later. Newburgh, New York, another early U.S. city with a trailing "h". ^ See Etymology of Burgh for more details. ^ Because the Board lacked the immediate means to publish and distribute its decisions (see pp. 9–10 of the report), its report was not actually printed in volume and distributed until 1892. The actual finalized decisions and recommendations do date to 1891, however. ^ Harper, Douglas. "Borough". Online Etymology Dictionary. Retrieved 6 August 2010. ^ a b c "How to Spell Pittsburgh". Carnegie Library of Pittsburgh. Archived from the original on October 1, 2008. Retrieved January 18, 2009. ^ "How to Spell Pittsburgh: General Forbes' Letter to William Pitt". Carnegie Library of Pittsburgh. Archived from the original on December 1, 2008. Retrieved January 18, 2009. ^ Van Trump, James. "The Controversial Spelling of "Pittsburgh", or Why The "H"?". Pittsburgh History & Landmarks Foundation. Retrieved 19 February 2010. ^ Boehmig, Stuart P. (2007). "3: A City Emerges from a Frontier Town". Downtown Pittsburgh. San Francisco, CA: Arcadia Publishing. p. 29. ISBN 978-0-7385-5042-8. Retrieved 19 February 2010. ^ Bannon, Shawn; Jason Coll; Bill Flanagan (21 February 2008). "The Naming of Pittsburgh". YouTube. Retrieved 19 February 2010. ^ The Pittsburg Daily Dispatch. 9 August 1847. ^ United States Board on Geographic Names (1892). First report of the United States Board on Geographic Names. 1890–1891. U.S. Govt. Print. Off. p. 8. Retrieved 4 August 2010. ^ a b c Stewart, George R. (1967) . Names on the Land: A Historical Account of Place-Naming in the United States (Sentry edition (3rd) ed.). Houghton Mifflin. pp. 342–344. ^ United States Board on Geographic Names (1892). First report of the United States Board on Geographic Names. 1890–1891. U.S. Govt. Print. Off. p. 34. Retrieved 4 August 2010. ^ "The United States Board on Geographic Names: Getting the Facts Straight" (PDF). United States Board on Geographic Names. November 2016. Retrieved 18 December 2017. It is sometimes incorrectly assumed that BGN decisions on names apply to everyone in the United States. The BGN was formed to provide uniform geographic name usage in the Federal Government and its decisions only apply to the Federal Government. ... BGN decisions are not binding outside the Federal Government. ^ a b Lowry, Patricia (17 July 2011). "Are yinz from Pittsburg?". The Next Page. Pittsburgh Post-Gazette. ^ Notes & Queries. Western Pennsylvania Historical Magazine. 2. The Historical Society of Western Pennsylvania. p. 65. ^ Macur, Juliet (1 February 2011). "A Windfall in Cardboard". The New York Times. p. 12. Retrieved 14 February 2011. ^ Cato, Jason (6 November 2010). "Honus Wagner card brings $262,900". Pittsburgh Tribune-Review. Retrieved 14 February 2011. ^ Doyle, Jack (28 May 2008). "$2.8 Million Baseball Card — 1909 Honus Wagner". The Pop History Dig. Retrieved 15 December 2017. ^ Smydo, Joe (11 June 2011). "PWSA prepares its own bottled water". Pittsburgh Post-Gazette. Retrieved 12 June 2011. This page was last edited on 22 December 2018, at 06:52 (UTC).